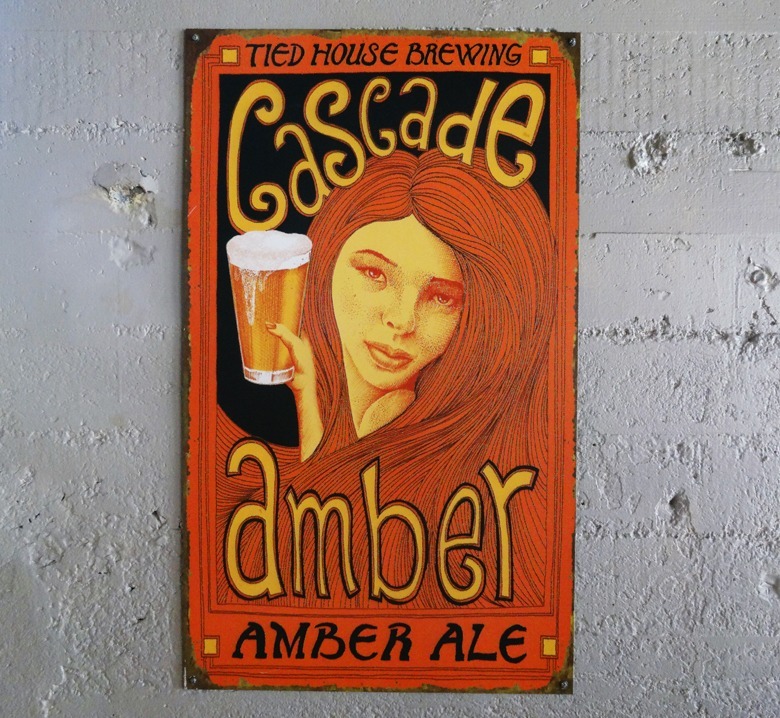 The vintage tin beer signs adorning the walls of local brewpubs in Mountain View. 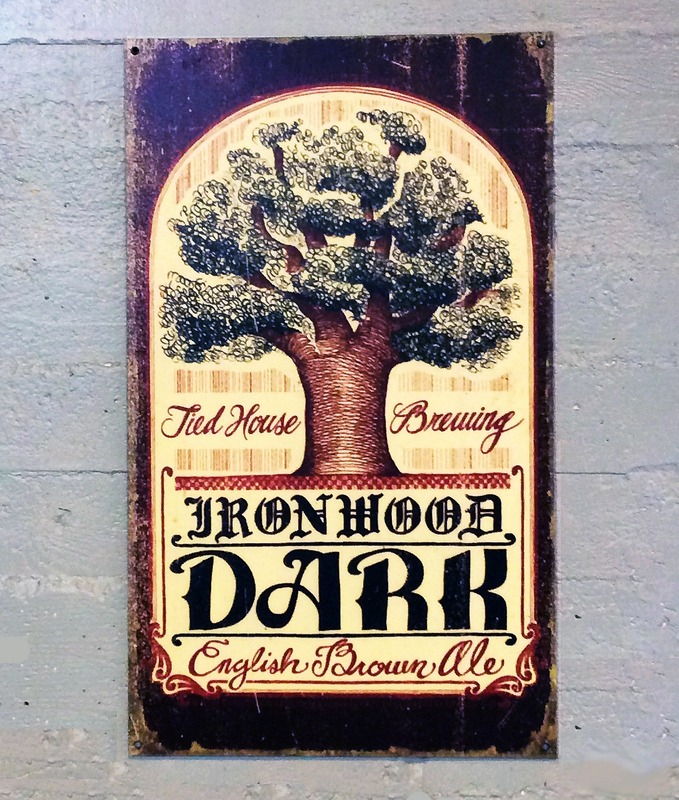 Tin and enamel have been used to create advertising signs since the 19th century, but very few signs exist today, yet alone hang on the walls of brewpubs in Mountain View in the heart of Silicon Valley! 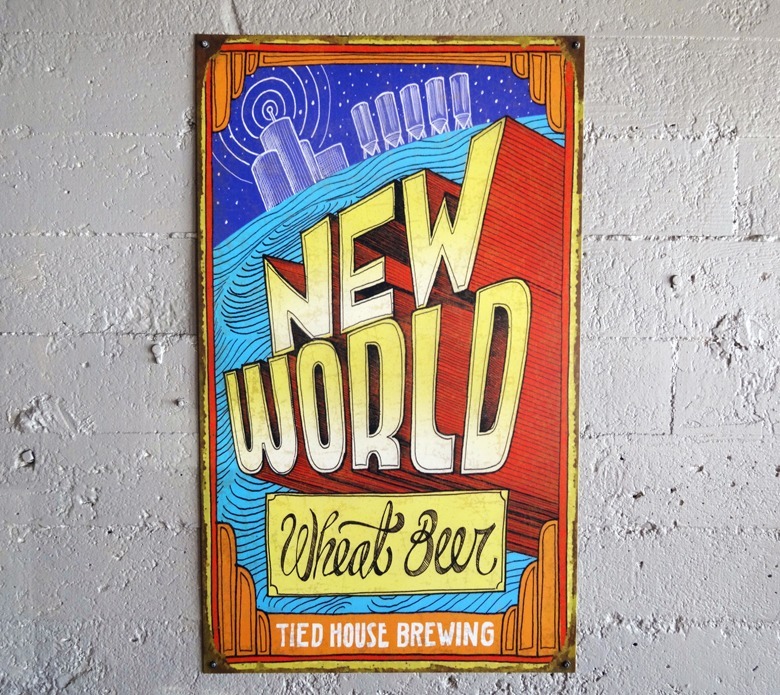 Today, tin beer signs are considered collector's items, so it's pretty cool to walk into an old school brewery like Tied House and see colorful, retro metal beer signs that Tied House created back in the 1980s to hang on their walls to advertise their unique craft beer. The appearance of vintage beer signs alone is enticing, but nothing compares to the backstory behind these special signs. To start, tin signs on a broad scale were believed to have come about due to the popularity surrounding pre-packaged, mass-produced goods that were commonly packaged in tins themselves. Tin signs provided a type of permanency that no paper advertisement could offer and were sometimes even covered in a protective glaze to ensure longevity. As for the earliest of vintage beer signs in specific, these were handcrafted, taking a decent amount of time to produce. As a result, many restaurants and stores carrying the items the signs were advertising often rented the signs rather than purchased them as they were not cheap to create. Vintage beer signs were frequently constructed from tin, wood, enamel, or other materials featuring one or a few bold-yet-muted colors. Nevertheless, these signs stood out with their detailed graphics and bold lettering, making them an attractive form of advertisement. Perhaps one of the biggest reasons vintage beer signs are still relished today is for their intriguing involvement during the 13 year-long Prohibition of 1920 and throughout World War II. During the Prohibition where alcohol was completely banned in the U.S., vintage beer signs surprisingly played an even stronger role than ever before. Hitting their peak production in the 1920s, beer signs were produced quickly and were more affordable thanks to a less tedious creation process: lithography. Beer signs of all shapes, colors, sizes, and materials ultimately allowed the best-of-the-best breweries to survive long after the Prohibition took place while weeding out the weaker breweries. In fact, Budweiser created a tin beer sign advertising their non-alcoholic beer to comply with the National Prohibition Act of 1919, or the Volstead Act, that would enact the 1920 ban of alcohol. Today, the sign (featured below) is worth approximately $750. When it came time for World War II, however, tin beer signs were often melted down for their metal content. This escalated to the point where tin production halted completely. Postwar, both porcelain and tin beer signs resumed production until the 1950s when signs made of plastic and steel were preferred. While pubs, breweries, microbreweries, and specific alcohol brands today are advertised via billboards, television commercials, and bright neon signs, the longing for getting one's hands on vintage beer signs is still there. 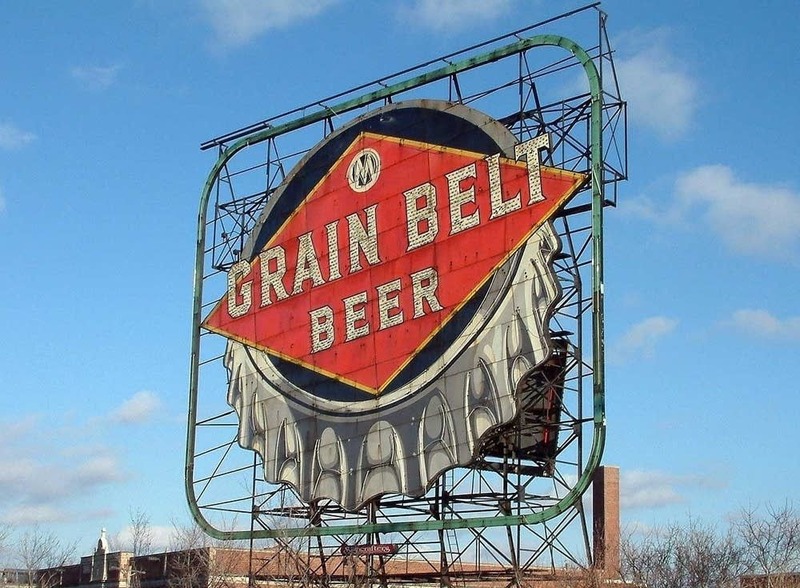 Today, the value of vintage beer signs comes down to several components. These signs can cost a meek $5 or can cost thousands of dollars depending on the brand or brewery advertised, whether or not the sign was handcrafted, where and when it was produced, the sign's rarity and originality, the material(s) used, and the overall condition of the sign. 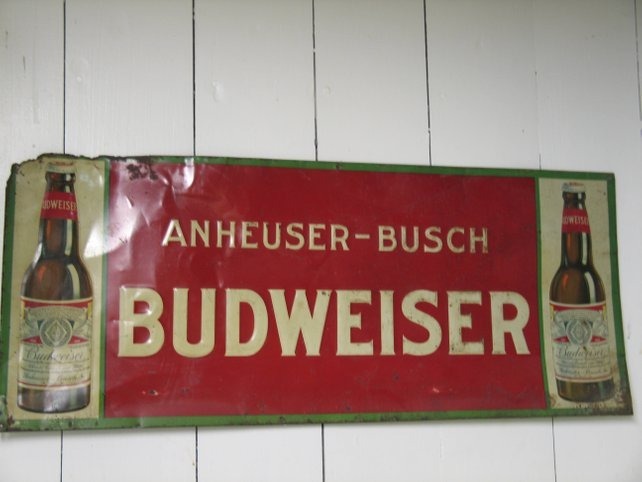 For example, a plastic beer sign made in the 1950s in China would cost significantly lower than a tin beer sign constructed during the early 1900s by hand in the U.S. Some of the most expensive old-fashioned beer signs today advertise Budweiser, Rainier Brewing Company, Hamm's Brewery, and Old Manhattan Beer, some of which are worth a whopping $20,000+! For tin beer signs in specific, it can be particularly difficult to find signs in pristine condition, in part explaining why they can be a treasure to come across. While vintage beer signs have become a memory of the past once they started to phase out around the 1940s, 50s, and 60s when neon beer signs began to appear in replacement, beer - and specifically craft beer - has still made a significant mark across the nation. In fact, with over 3 million barrels of craft beer produced annually, California is the second state with the largest craft beer production, it makes complete sense why Tied House Brewery in Mountain View, California offers two dozen craft brew beverages along with exquisite menu items from their Prosciutto and Arugula Flatbread to their Double en Fuego Burger with a spicy twist. Tied House Brewery, South Bay's original microbrewery, has been in operation for over 30 years. There, apart from enjoying great brew and bites to eat, make sure to enjoy the striking metal beer signs hung around the Mountain View restaurant that provide an instant blast to the past via their own version of tin beer advertising. About cute little designs getting some attention. Why I use Procreate, SketchUp, Autodesk 3ds Max and other software to create my art. This is a small collection of my recent artwork.